The Discovery Museum, run by Portland’s World Forestry Center, is a museum focussed solely on teaching the importance and interesting science of trees. The museum covers 20,000 square feet, with several real trees and shrubs inside. 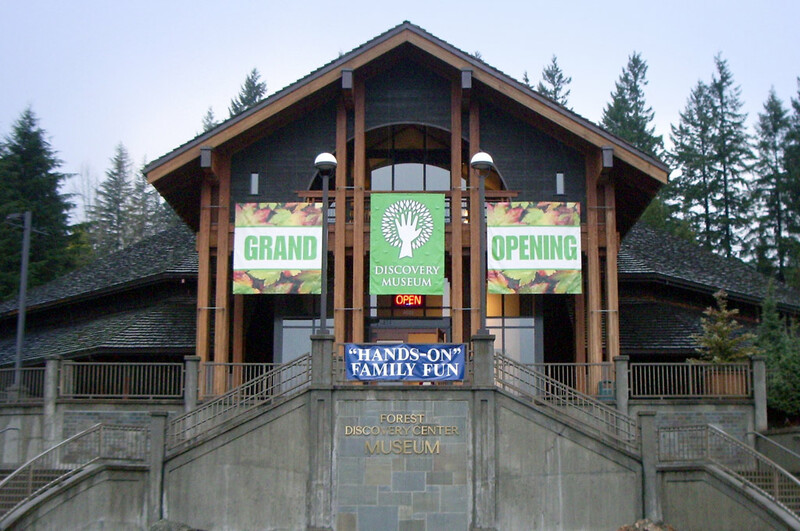 The first floor is dedicated to instructing about the forests around Oregon, and the role they play, both for animal habitat and ecological factors, and providing lumber for humanity. Everyone’s heard of the water cycle, but few know that forests have similar cycles and systems. But you will, after visiting the museum! Through the first floor’s many exhibits you’ll learn about the animals that live under the forest, how forests are important to rivers, and more. The Discovery Museum’s second floor has a portion displaying special temoporary exibits. The other exhibit galleries on the second floor will show you all sorts of things, notable among which are the different types of trees and forests that grow througout the world, the kinds of work people do in the forests, and what people in areas around the world are doing to promote environmental sustainability. Several other items of interest can be found at the World Forestry Center’s museum, such as a 10,000 pound petrified Sequoia tree stump, and a locomotive built in 1909, that spent its life as a logging train.